17 December 2010, at 12:41p.m. 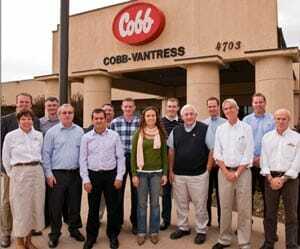 US - The potential of the Cobb700 broiler for further processed products was the focus of the French Group Glon's visit to the Cobb world headquarters in Arkansas. The party, led by Paul Lopez from the group's processing plant Boscher and Stephane Athimon from its agricultural division Sanders, visited two processing plants and several broiler farms where they saw the Cobb700 at different ages to see how the bird is managed to obtain the best performance. Wout van Wolfswinkel, parent stock sales manager for Cobb Europe, said: "The visit showed them the good live uniformity that the Cobb700 can achieve out of a straight-run chicken, and they appreciated the potential of such a high yielding bird."